Feelin' Groovy? 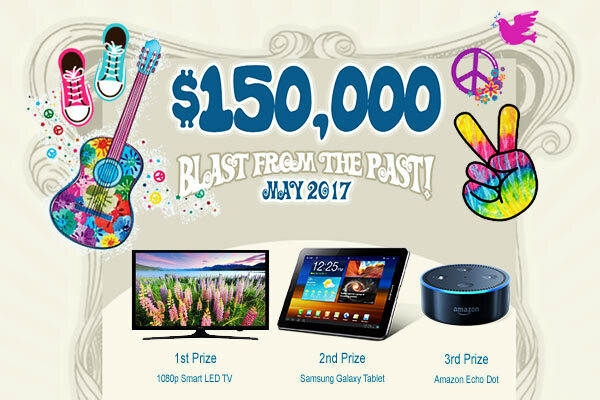 Join AmigoBingo $150,000 Blast from the Past Contest! Let's make some good times and memories that last! Put on your bell bottoms and love beads because it’s time to groove with $150,000 up for Grabs and amazing Grand Prizes at Amigobingo.com Blast from the Past Contest. Starting May 1st, players will have the chance to win over $5,000 in GUARANTEED CASH EVERY week, a chance to hit a Jackpot of $5,000 EVERY day, the opportunity to win one of the THREE AMAZING GRAND PRIZES, and over $1,500 in EXTRA Prizes this month! Groovy games will be available at the beginning of each contest week with fantastic jackpots of up to $5,000 CA$H and a special Buy 15 Get 5 Offer on all cards. How to participate in this fun tie dye event? You just need to deposit, play and bingo on ANY Groovy Games during the day. Special Patterns play 24/7 in Madness Bingo Room and extra weekly prizes are credited at the end of each contest week. On June 5th 2017, we´ll randomly select the (3) GRAND PRIZE winners (1st prize Smart TV, 2nd prize Samsung galaxy tablet, and 3rd prize Amazon echo dot) from all four contest weeks’ winners. Remember, the more entries you collect, the more chances you have to win it. Don your afros, break out your platform shoes, its going to be a month of fun that just cant lose! Join AmigoBingo this May for a groovy good time. New members get a $50 FREE trial bonus and new depositors an incredible 1000% Welcome Bonus package. This entry was posted in Blog on May 10, 2017 by Amigo Bingo.